The Zeiss Milvus 50mm f/1.4 Lens, along with the rest of the Milvus lenses, represents the epitome of build quality while remaining impressive from an image quality perspective as well. This manual-focus-only lens will not be heralded for its light weight, but ... it will likely be around to make great images for even your grandkids. In a single press release, Zeiss announced 6 new lenses, comprising the newly introduced Milvus line. Of those 6 new lenses, two received new optical designs and this lens, the Zeiss Milvus 50mm f/1.4, was one of them. That new Zeiss lenses would be amazingly well built was expected and all but assured, but the new optical design created strong anticipation. I'm always talking about the importance of selecting the right focal length(s) because the focal length, in conjunction with the desired subject framing, is what determines perspective (and the working distance). When it comes to selecting a focal length because it has so many uses, 50mm is at the top of the list as the perspective this lens provides is ... a very useful one. On a full frame body, a 50mm focal length appears very natural (often referred to as "normal"), approximating how we perceive a scene with our own eyes in field of view and perspective terms. In the film days, a 50mm lens was often available in a 35mm film SLR camera kit (my first SLR camera came with one), indicating this focal length's general purpose usefulness while bolstering its popularity among photographers. While not available in manufacturers' kits today, Canon and Nikon both have four 50mm prime lenses in their lineups, showing the continued popularity of this focal length. This focal length is great for general purpose uses (leave it mounted to your ready-for-immediate-use camera) and will frequently find application in fashion, portraiture, weddings, newborns, parties, events, banquets, documentary, lifestyle, sports, architecture, around-the-house needs, street photography and general studio applications including product photography and much more. As a number of those good 50mm uses include people as subjects, it bears mentioning that a 50mm lens used on a full frame body is modestly too wide angle for tightly framed head shot portraits (for my taste), but 50mm is very nice for less-tightly-framed head plus shoulder portraits and more loosely framed portraits. 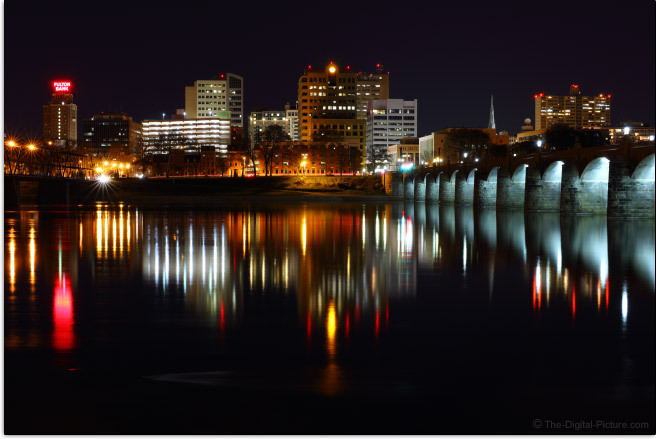 Nearly any lens can be used for landscape and cityscape photography and the 50mm focal length works well for this purpose. The wider the aperture, the more light that reaches the imaging sensor and only a tiny handful of lenses have an aperture wider than this one. An f/1.4 aperture is excellent for stopping action and handholding the camera under low light conditions. The shallow f/1.4 depth of field must of course be acceptable to you in these circumstances, but shallow depth of field is another highly desired lens capability, excellent for making the subject pop from a blurred background. Note that, especially under full sun conditions, a 1/8000 shutter speed may even be marginally fast enough to avoid blown highlights. Cameras with shutter speeds limited to 1/4000 may need the assistance of a neutral density filter. 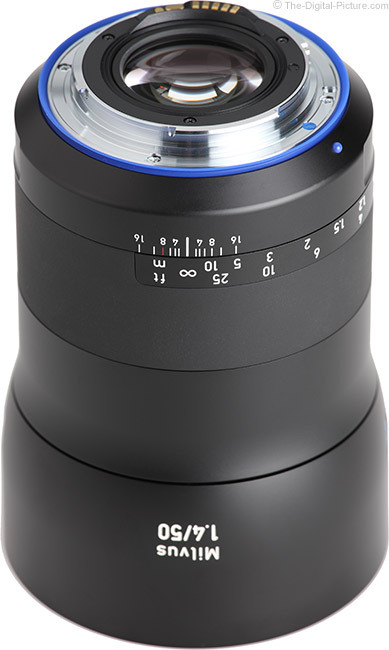 Those using the Zeiss Milvus 50mm f/1.4 in Nikon ZF.2 mount have a manual aperture ring available. Additionally featured in this Nikon lens version is a de-clicked aperture feature that can be enabled with the turn of a screw, allowing smooth, completely variable aperture changes (of primary interest to videographers). Always wanted to try f/2.9? This lens has you covered. Wide aperture 50mm (or close to 50mm) lenses have not been known for their wide aperture image sharpness, but Zeiss blew that stereotype out of the water with their 55mm f/1.4 Otus Lens. With a brand new optical design being introduced after the Otus, I was very anxious to see how sharp a similar-appearing but far more affordable lens version would be. 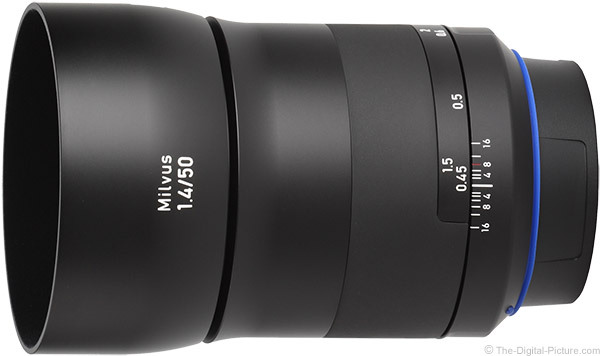 While the Otus still rules at f/1.4, the new Milvus 50 competes very well against the best of the rest and completely trounces its Zeiss predecessor. At f/1.4, you should expect to see a bit of softness in the center of the frame with that quality holding out until near the extreme full frame corner portion of the image circle is reached. A strong improvement is seen in the center of the frame at f/2 and nearly the entire frame is razor sharp at f/2.8 and beyond until the effects of diffraction set in. Following are three sets of comparisons captured with a Canon EOS 5Ds R. These images were captured in RAW format and processed in the Standard Picture Style with sharpness set to "1" and cropped to 100% resolution. First up are the center of the frame examples. I didn't include f/5.6 and narrower examples because they are no sharper than f/4 which is about perfect. Next up are examples from the top left corner. The various tree limbs showing in this picture have some depth. Not all should necessarily be in focus at f/1.4, but some of them should be within the sharp plane of focus, even if some curvature of plane was present and especially at this focus distance. Extreme corner sharpness does not always matter, but this lens probably isn't going to make you overly happy if it does. You surely noticed some darkening in the f/1.4 corner examples above and as is typical for wide aperture lenses, there is some vignetting present. Expect around 3 stops of vignetting in f/1.4 corners. To make it go away, use a narrower aperture. 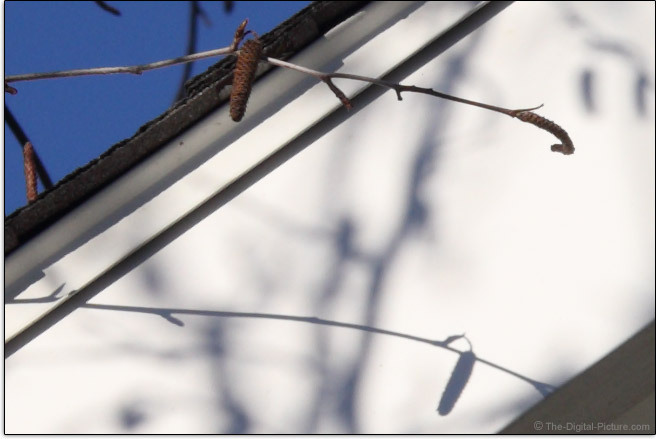 At f/2, about 2 stops of peripheral shading remains and a barely noticeable roughly .8 stops remains at f/2.8. At f/4 and narrower, a negligible .3 stops of shading persists. If shooting wide aperture portraits, I recommend using your software's peripheral illumination correction when the subject's face falls under the more heavily shaded portion of the frame. The most frequent and obvious type of CA (Chromatic Aberration) seen in a lens is lateral (or transverse) CA. Lateral CA shows as various wavelengths of light being magnified differently with the effect being increasingly noticeable toward the image circle periphery, causing the most-effected area of the image to appear less sharp. Look for the strongest color fringing along edges of strongly contrasting lines running tangential (meridional, right angles to radii) near the corners of the frame, generally irrespective of the aperture used. 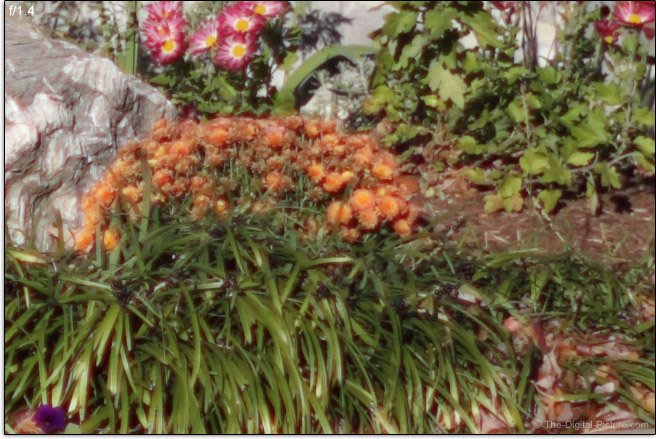 Fortunately, lateral CA is easily software corrected (often in the camera) by radically shifting the colors to coincide. Also fortunate is that this lens controls lateral CA very well. 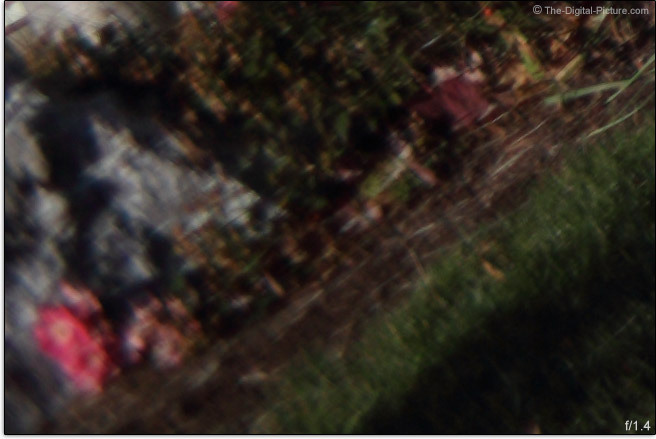 Following is a 100% crop from a near-extreme corner of a Canon EOS 5Ds R image. I see nearly no fringing in this sample containing near worst-case lines and colors. To skip right to the next answer, start reading below the next sample images. Otherwise, at the risk of becoming "blurry" in your understanding ... common in wide max aperture lenses (at least in those without true apochromatic correction) is axial (longitudinal, bokeh) CA. Axial CA causes non-coinciding focal planes of the various wavelengths of light, or more simply, different colors of light are focused to different depths. With blue being harder to control than red and green, the blue/purple wavelength range is most typically visible. Axial CA remains at least somewhat persistent when stopping down with the color misalignment effect increasing with defocusing. 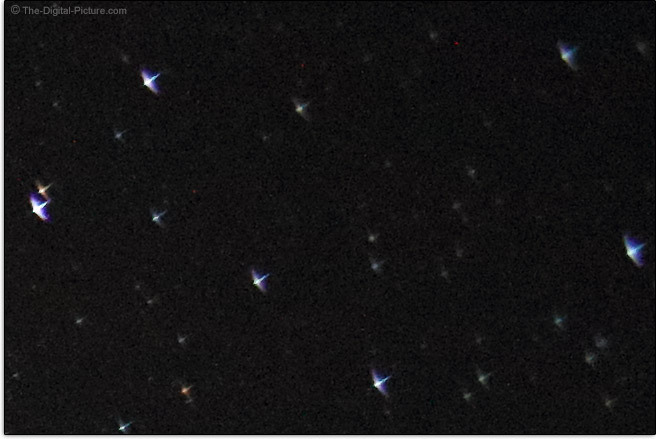 Typically, red fringing turns purple when performing a full extent focus adjustment. Another common lens issue affecting sharpness in ultrawide aperture lenses is spherical aberration along with spherochromatism, or a change in the amount of spherical aberration with respect to color (looks quite similar to axial chromatic aberration, but is hazier). The spherical aberration color halo shows little size change as the lens is defocused and stopping down one to two stops generally removes this aberration. In the real world, lens defects do not exist in isolation with spherical aberration and spherochromatism generally found, at least to some degree, along with axial CA. These combine to create a less sharp, hazy-appearing image quality at the widest apertures – and create a challenge for evaluating a lens. Since all colors are not focused identically, the perfect test focus distance setting becomes vague with the high resolution black and white test chart being especially unforgiving. 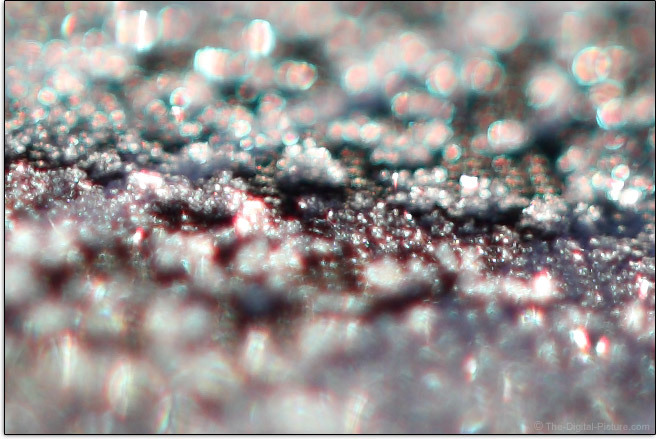 The focus distance setting that shows the highest resolution must be selected, but with colors not being focused identically, some fringing is commonly seen at very wide apertures. The Zeiss Milvus 50mm f/1.4 has a small-moderate amount of axial CA and spherical aberration/spherochromatism as seen in the 100% EOS 5Ds R crops shown above. Notice how the fringing color changes from front to back? These issues clearing are also the reason that this lens becomes very noticeably sharper when stopped down. All Milvus lenses have a newly optimized T* anti-reflective coating for improved contrast and flare control. At f/1.4, this lens shows nearly no flare effects even with the sun in the corner of the frame. As the vignetting clears with a narrower aperture, a very small amount of flare becomes apparent in just the right scenarios (such as a clear blue sky with the sun in the corner of the frame). That flare spot goes away as the aperture narrows until flare streaking becomes slightly noticeable at f/11 and f/16. Overall, this lens is an impressive performer in this regard. Coma is generally recognized by sharp detail contrast towards the center of an image and long, soft contrast transition toward the image periphery. Coma is most visible in wide aperture corners and significantly resolves when the lens is stopped down. 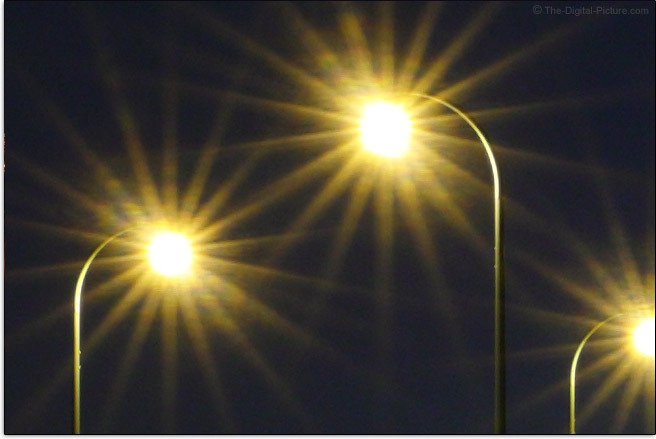 The pin-point stars in the night sky are the subject that brings this aberration out most easily for me. 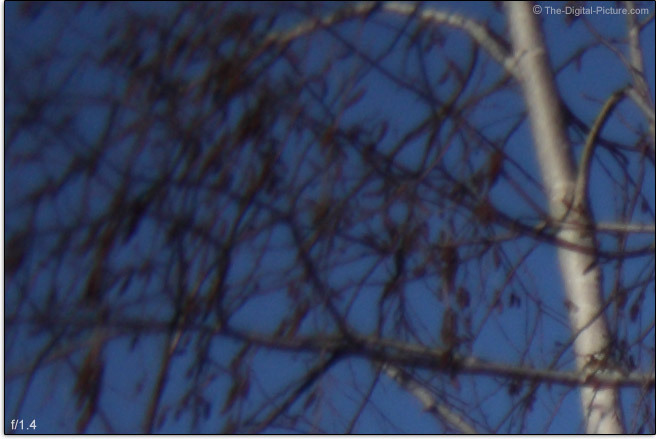 Following is a 100% resolution f/1.4 crop from an EOS 5Ds R corner, showing this lens to have an average amount of coma. The Zeiss Milvus 50 has a small amount of barrel distortion that might be noticed in some images with straight lines running along the edge of the frames. You may also see this lens' center of the frame details appearing slightly larger than those from lenses with lower (or pincushion) distortion in comparisons using the site's image quality tool. Here is the edge of a window matched to the edge of the frame, a worst-case example. A positive attribute I'm seeing across the Milvus line is bokeh quality. With a wide open aperture, the blades do not affect the image and specular highlights are rendered very circular (at least in the center of the frame). Stop a lens down and the aperture blades show increasing involvement with their quantity and shape being particularly influential in bokeh. This lens' 9 aperture blades are shown taking shape at f/5.6 in the examples shared below. 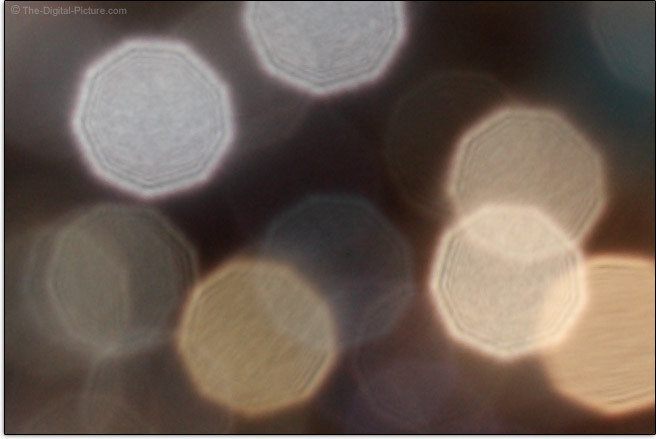 While some concentric rings can be seen around the borders of specular highlights (very normal), the outer transition is not harsh and the centers are very smooth for good bokeh. With an odd-numbered aperture blade count, distant point light sources showing a star-like effect will have 18 points. The points on these stars are coming from the blades of the aperture. Each blade is responsible, via diffraction, for creating two points of the star effect. If the blades are arranged opposite of each other (an even blade count), the points on the stars will equal the blade count as two blades share in creating a single pair of points. The blades of an odd blade count aperture are not opposing and the result is that each blade creates its own two points. Nine blades times two points each create 18-point star effects. Overall, the Zeiss Milvus 50mm f/1.4 delivers very good image quality, image quality that places it among the best of the current crop of wide aperture 50mm lenses. Image quality is highly dependent on accurate focusing and, with all Zeiss Milvus lenses, that accuracy is completely in your hands. The Milvus 50 and the other Zeiss Milvus lenses are manual focus only. But, these lenses deliver the ultimate manual focusing experience. The extremely smooth focusing ring has a huge 225° of rotation. Manually adjusting from minimum focus distance to infinity requires a very significant focus ring turn, but very precise focusing is made available at all focus distances. The focus ring is smooth in a second way. While the ring consumes most of the lens barrel, only the rear half is rubber coated. With that smooth-surfaced rubber coating transitioning to smooth metal without a diameter change, it is not always easy to find the focus ring by touch. While I find the focus ring resistance to be ideal (more firm than the Otus), the resistance is enough that if the ring is grasped in front of the rubber, your fingers will slip without a firm grasp on the metal. 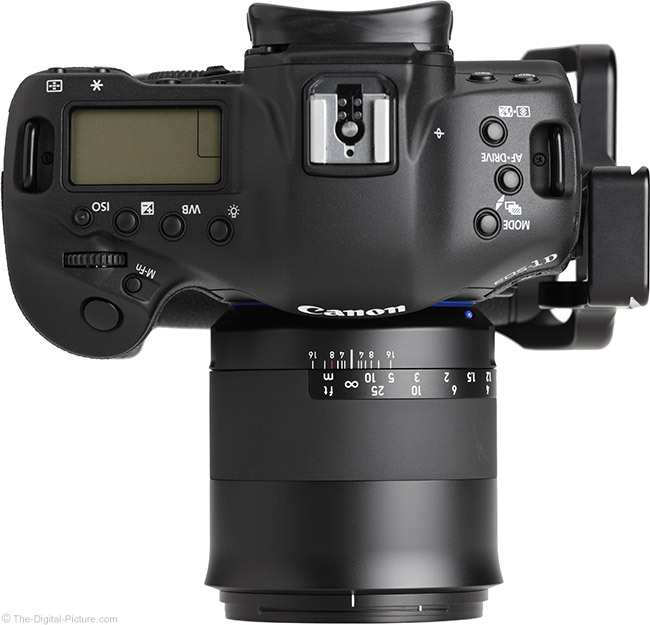 If shooting in a cold environment, the rubber will not feel as cold as the metal portion of the focus ring and will therefore be easier to find. But, if shooting in the cold, you will probably have gloves on and with gloves on, the rubber is even harder to find by feel. If your fingers slip, you probably have grasped the ring too far out. That was probably too much said about a minor operating issue. Few non-Zeiss lenses are as nice to manually focus as this one. Just as expected, there is no play in this focus ring. The Zeiss Milvus 50mm f/1.4 provides a full DOF (Depth of Field) scale and, with the large amount of rotation, this ring includes aperture marks as wide as f/2.8. While some other non-Zeiss lenses include depth of field marks, few provide marks wider than f/11. Of note, primarily for videographers, is that Milvus 50 f/1.4 subjects change size in the frame by a modest amount during moderate or longer focus distance adjustments. As of review time, most 50-ish mm lenses have a 0.15x MM (Maximum Magnification) and the 50mm f/1.4 Milvus precisely reaches this norm at its 17.7" (450mm) MFD (Minimum Focus Distance). A 0.15x MM is high enough to allow moderately tight head shot portraits to be captured, but this lens is not going to be confused with a macro lens. To reduce the MFD and thereby increase the MM, mount an extension tube behind this lens. Infinity and long distance focusing are sacrificed with an ET in use. 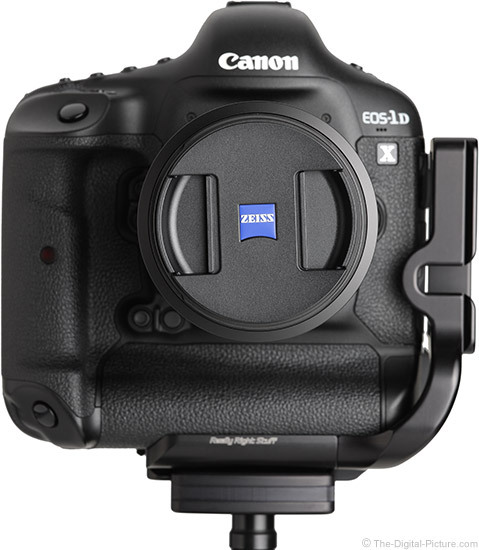 Zeiss does not have teleconverters available and a third party teleconverter would not be able to have any protrusion into the back of this lens due to the far rearward placement of lens elements. Especially when a lot of time is spent with a camera in hand, it is, for many, worth the additional investment of a high quality lens simply for the pleasure derived from using such a precision instrument. This lens has that feature. Zeiss Otus design features have been strongly incorporated into the Milvus family design. As with the Otus, all lettering and other markings on this lens are etched into the metal lens barrel, focusing ring and lens hood. Having the focal length and aperture so easily visible on the hood is especially nice, making lens ID easier. The smooth overall shape and smooth rubber focus ring are equally Otus-like. The image above shows the Milvus 50 f/1.4 between its direct predecessor (left) and the Otus 55 f/1.4 (right). The Milvus has grown significantly in size and has taken on a far more modern shape. 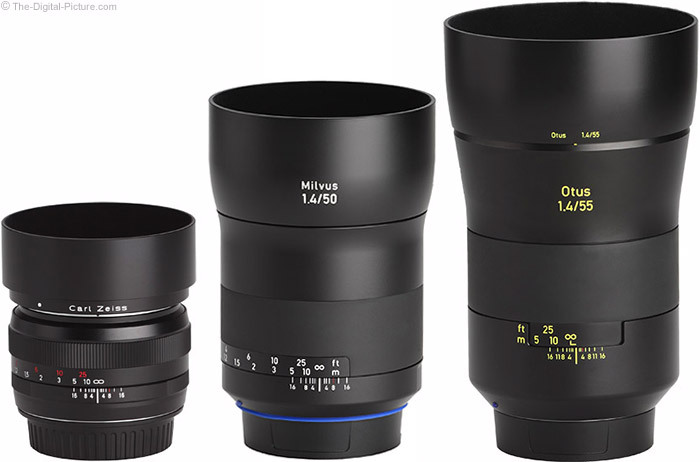 As discussed earlier in the review, the Milvus is the middle child in terms of Zeiss 50/55mm image quality and it is also the middle child in terms of size and weight. Nothing but focus ring. There is so much focus ring that just enough fixed lens barrel at the rear of this lens is available to grasp for mounting and dismounting. Without autofocus, image stabilization, a zoom range and any other features, this lens needs no switches. Merge very a high quality build with few features and high reliability can be the expected result. 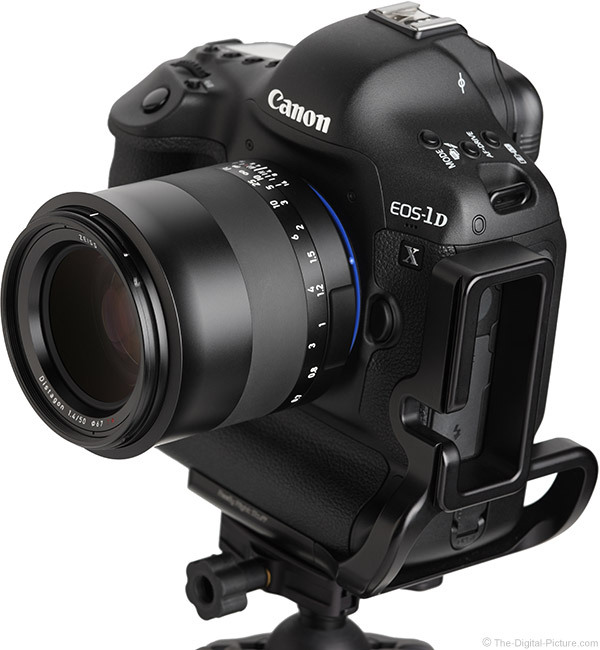 Easy to say is that this lens will not encounter image stabilization system failure and the autofocus system will similarly not cause you any trouble. Featuring an all-metal exterior, the Milvus 50 f/1.4 feels like it would last a lifetime and beyond. As you can see in the product images above, this lens has a small amount of extension when focusing. With the lens hood moving forward and leaving a small gap, I thought that pinched fingers were going to be an issue. Fortunately, my concern was unfounded. The gap isn't wide enough for this to occur. The price paid for strong metal build quality and a max wide aperture is typically in weight and this lens is no exception. 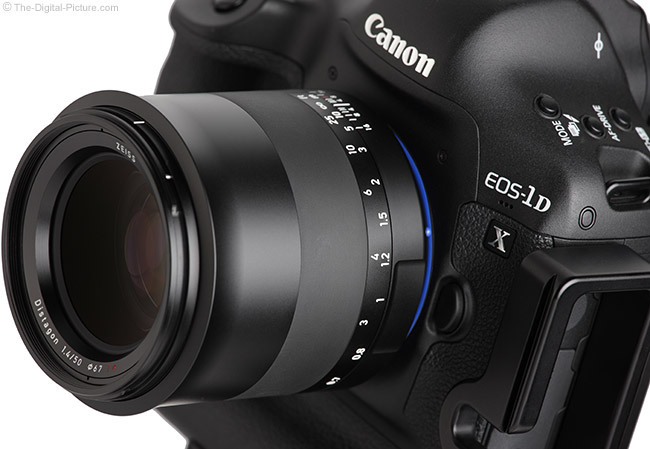 Weighing in at only 4 oz (110g) less than the comparable Otus places this lens among the heaviest in its 50mm class. Keeping us grounded is that the Zeiss version's actual measured weight is only 0.7 oz (20g) heavier than the Sigma 50mm f/1.4 Art Lens' actual weight (29.3 vs. 28.6 oz / 830 vs. 810g), basically leveling out this comparison. While the Milvus 50mm f/1.4 lens is not uncomfortable to use for even extended shoots, you are going to know that something is in your hand and, if your pack has Zeiss Milvus lenses covering a range of focal lengths, that pack may become uncomfortable on your back over time. Here is a size and weight comparison chart showing factory specs. For many more comparisons and to see actual measurements, review the complete Zeiss Milvus 50mm f/1.4 Lens specifications. In addition to showing that the Zeiss and Sigma lenses have nearly equal weights, actual measurements (including the lens mount) show the Sigma to be longer than the manufacturer specs table above indicates. 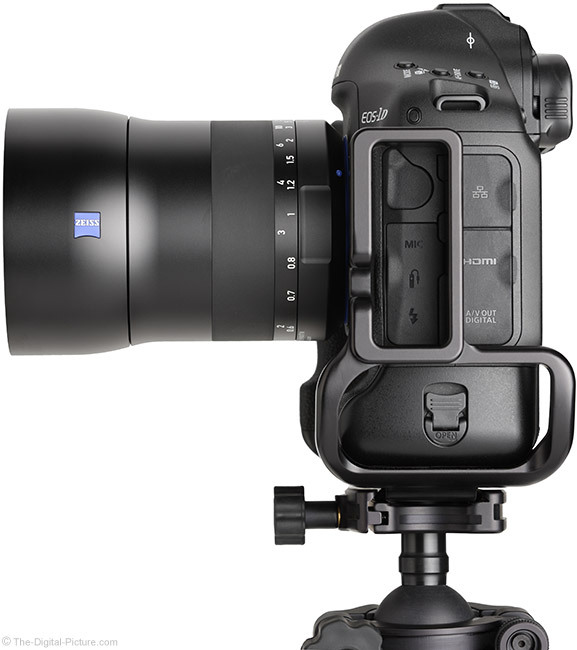 In a side-by-side comparison, the Zeiss is also more-noticeably shorter than the Sigma. Use the site's product image comparison tool to visually compare the Zeiss Milvus 50mm f/1.4 Lens to other lenses. The Zeiss Milvus 50mm f/1.4 Lens accepts standard threaded 67mm filters. These medium-sized filters are rather common when filter sharing is a consideration. 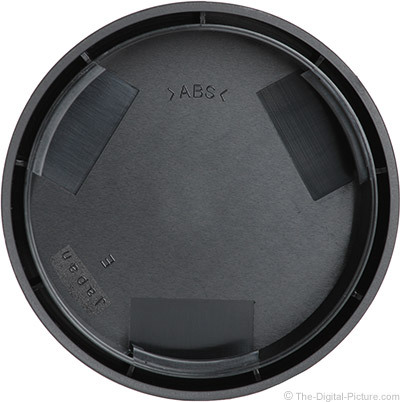 All of the Zeiss Milvus lenses come with a very strong metal hood included. These hoods are designed to beautifully integrate with the lens body, providing a substantially enlarged and very comfortable working surface. The hood is so well integrated that the lens doesn't look quite right to me without the hood in place. I hesitated to even take product photos sans hood, but ... I opted to stay with the site standard, showing pics of both variations. The 50's hood is large enough to provide significant protection from both bright light and impact, but circular polarizer filters still remain reachable for adjustment with the hood in place. Reversed, Milvus hoods remain compact and this lens will sit on a flat surface very nicely when oriented mount-up with its hood in either orientation. These hoods feature interior flocking for maximum light blocking. Even the caps are new. The Zeiss Milvus front lens cap is one of the nicest I've used, featuring an easily gripable center-and-side-pinch design. The rear cap features a double-wall design, a change from the older single-wall cap included with the pre-Milvus 50mm lens. Zeiss says that the purpose for this change is purely aesthetic, though it appears to be a slightly more protective design. 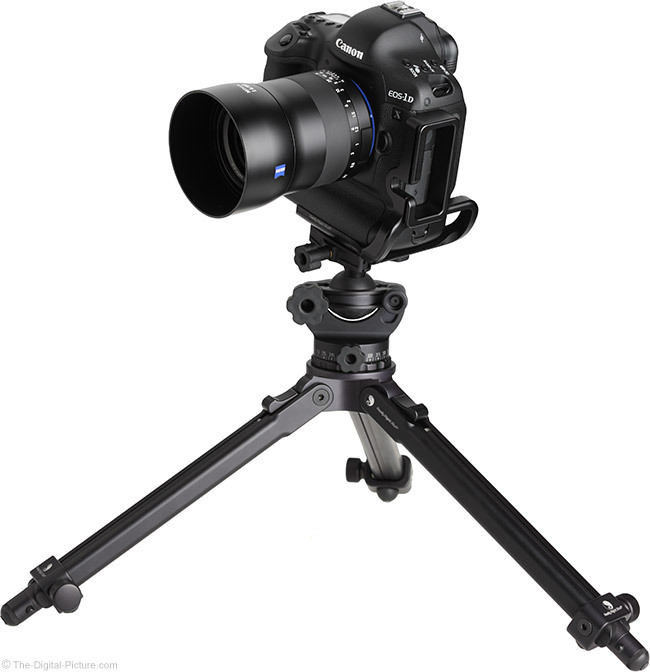 Zeiss does not miss with the out-of-the-box experience. Remove the outer box sleeve to find a somewhat large but very protective hinged box with cut-out foam cradling the lens and hood in place. This box is nice enough that I wish Zeiss had taken the next step of providing a hard plastic shell case with latches or something similar that would hold up better for use in the field. Lowepro's Lens Cases get my vote as very nice and affordable solutions for single lens storage, transport and carry. You are not likely going to hear anyone buying or recommending Zeiss lenses based on their low pricing as that is not Zeiss' niche. But, this lens is only moderately-priced and many variables must be considered when determining a lens' value. A lens failure on a single big shoot can easily cost far more than the price of this lens. Also hard to put a price tag on is the value of the enjoyment derived from using such a high grade lens. People spend extreme amounts of money on luxury cars (hopefully) because they enjoy driving them. A lens is similar in this regard. While this lens costs noticeably more than the Sigma 50 Art lens, it costs noticeably less than the Canon 50 f/1.2L. Some will think this lens is a great value while some will think otherwise. I know, that is vague, but we all value our lenses and money differently. Again, I'll call the price moderate and say that the value is there. 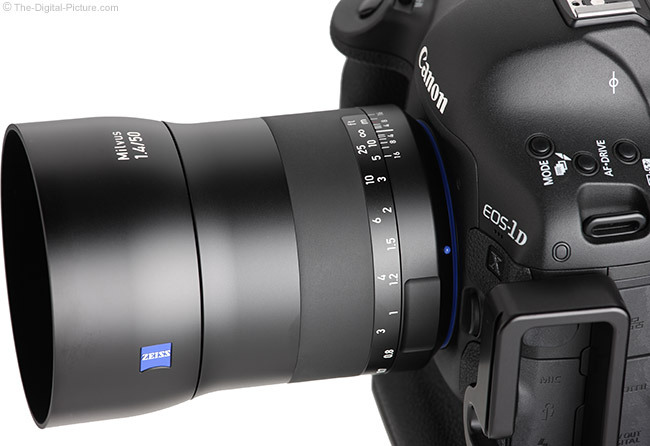 The Zeiss Milvus 50mm f/1.4 Lens is available in Canon (reviewed) and Nikon mounts. At this point in the review, I often include my standard disclaimer, warning of potential issues when using non-camera manufacturer brand lenses. Since the Zeiss Milvus lenses do not include autofocus, I view the risk of incompatibility in existing or future camera introductions as being quite low. Zeiss Milvus lenses include a 2 year warranty, twice as long as Canon's USA and international warranties, but less than half as long as Nikon USA's 5-year lens warranties. A lens' value is often best derived by comparing it to the alternatives and, at review time, this lens is going to be compared most frequently to the Sigma 50mm f/1.4 DG HSM Art Lens. As already established, these two lenses are similar in size. The Zeiss is the better built option, has a much longer focus ring rotation (225° vs. 92°) for better precision manual focusing, has less flare and takes smaller filters (67mm vs. 77mm). The Sigma's advantages include modestly sharper f/1.4 image quality, less vignetting, less distortion and a slightly higher maximum magnification (0.18x vs. 0.15x). The Sigma has a noticeably lower price tag and of course has the autofocus feature which many will appreciate. 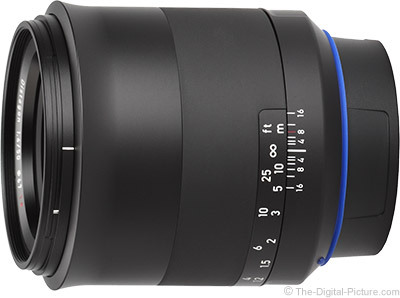 A lens I've been mentioning throughout the review is the Zeiss 55mm f/1.4 Otus Lens. This stablemate is the ultimate performer in this class (it really is something special), but its greatness is reflected in its price tag that is as special as its image quality (over 3x higher than the Milvus). Along with being the sharper lens, the Otus has slightly less vignetting and slightly less distortion. The Milvus is smaller and has the weather sealing advantage. 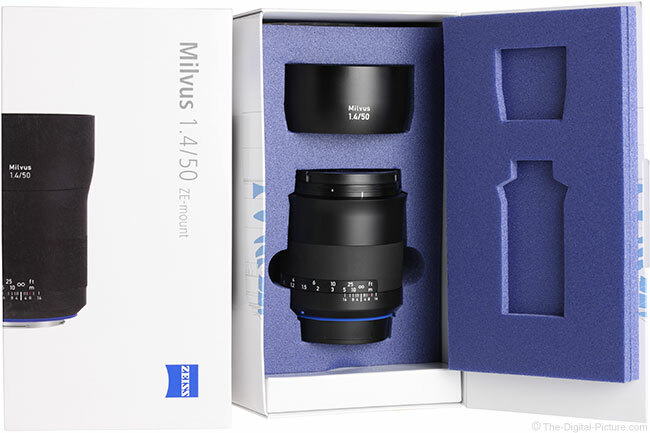 Those using the predecessor Zeiss 50mm f/1.4 Classic Lens, the upgrade to the Milvus is one that you will want to make. Image sharpness alone warrants the upgrade cost. 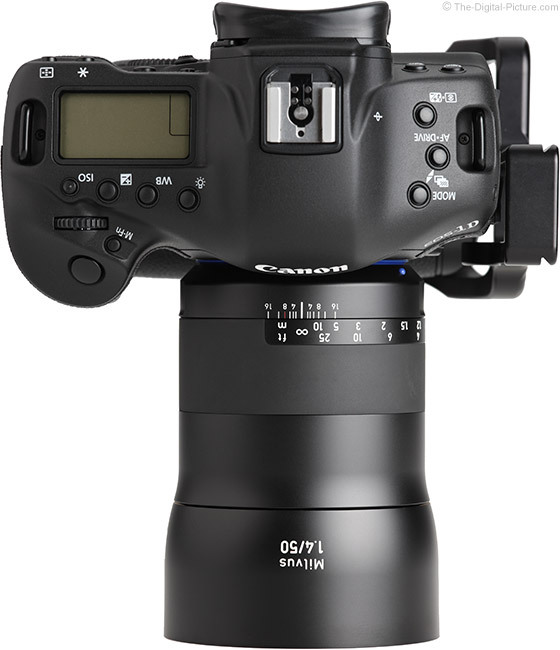 Canon DSLR owners will be certain to consider the focal length and max aperture-matching Canon EF 50mm f/1.4 USM Lens. The Zeiss Milvus handily bests the Canon in image quality at the wide apertures and is significantly better built including weather sealing. The Canon is much smaller, much lighter, much less expensive and it has autofocus. The Zeiss Milvus also handily bests the Canon EF 50mm f/1.2 L USM Lens in image quality at the wide apertures and this lens costs even more than the Milvus. 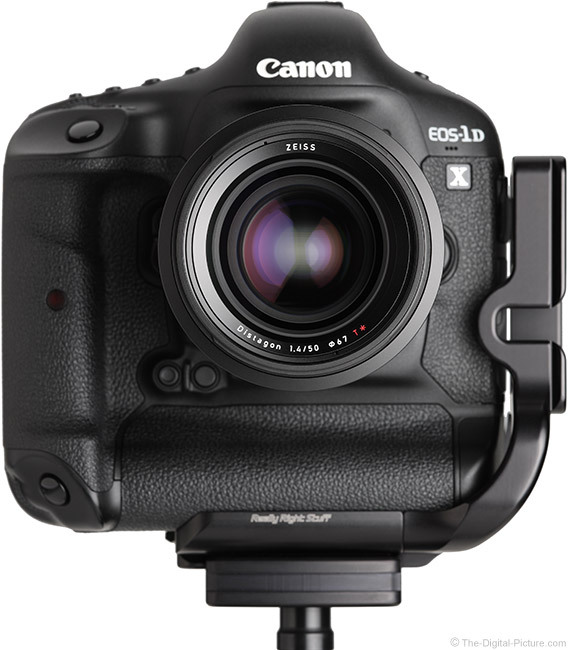 The Canon has a 1/3 stop wider max aperture, is smaller/lighter and again, provides autofocus. Nikon DSLR owners will certainly look at their camera maker's equivalent 50mm f/1.4 lens, the Nikon 50mm f/1.4G AF-S Lens. Again we see the Milvus looking better in wider aperture image quality. The Nikon is much smaller, much lighter, much less expensive and, you are tired of hearing me say this, it has autofocus. Did I miss your favorite lens in these comparisons? Use the site's comparison tools to compare the Zeiss Milvus 50mm f/1.4 Lens to many other lenses. Definitude: "definiteness; exactitude; precision." [Dictionary.com] Sounds like a fitting word for use with the Zeiss Milvus lens line (and it is a fun word to say). There are good reasons why people love Zeiss lenses so much, especially the unbeatable build quality. The 50mm focal length brings great usefulness with it as does the f/1.4 aperture. With image quality that is near best-available, the lack of autofocus is going to be the biggest drawback to those considering purchase of this lens. If manual focus works for your needs, definitely include this lens in your short list.